Thanks to Michael Zimmer for passing this site along on his blog. The one thing I really wish I had was some of the stories my grandparents told about growing up in Italy. I hear some of the stories from relatives that remember bits and pieces of them and I remember some of those stories, but we all know what happens when you play the telephone game. Now there is a way for our generation to save these important stories for our future generations. "StoryCorps is an independent nonprofit whose mission is to provide Americans of all backgrounds and beliefs with the opportunity to record, share, and preserve the stories of our lives. Since 2003, over 50,000 everyday people have interviewed family and friends through StoryCorps. Each conversation is recorded on a free CD to share, and is preserved at the American Folklife Center at the Library of Congress. StoryCorps is one of the largest oral history projects of its kind, and millions listen to our weekly broadcasts on NPR’s Morning Edition and on our Listen pages." They have places set up all around the country for people to make an appointment and tell their story. Over time, these stories will help define who we are as a people and it can be an invaluable resource in teaching history. History is often viewed as old men doing things that happened a long time ago. History texts are just filled with names and dates and students find it hard to engage in learning that information. I feel that StoryCorps offers the chance for History teachers to bring stories of people who lived history to the classroom. There is an educators toolkit that will help teachers considering using StoryCorps in the classroom. One example of how this site might be utilized in the classroom is the September 11th section. There is a full collection of stories told by various individuals about how the events of September 11th have impacted their lives. Watching news stories and researching information on the internet is one thing, but hearing people talk about the event is important as students learn the importance of Primary Sources. Listening to these stories could reach some students in a very important way that a text book might never accomplish. Take some time and check out the site. You might find it helpful for your class or you might even decide to make an appointment and telling your story to America. After a few days of sending out Tweets, DMing people from around the state and having great friends spread the edcamp Detroit idea around, I feel like there are enough people interested to get this thing off the ground. For starters, check out http://edcamp.wikispaces.com/edcamp+Detroit to join the wiki and add your thoughts, ideas, information to the edcamp Detroit page. The more that want to help, the better. I'm excited and scared to move forward now. I have never run a conference. I'm just a nerdy teacher, what do I know about conferences, especially "unconferences"? However, I know that I'm surrounded by amazing people and that together we can pull off a heck of an unconference and edcamp Detroit will be the envy of the edutech community. Please stop by the wiki and offer any ideas or thoughts that you might have. You don't have to volunteer for anything or even live in the area to help out. Let's make edcamp Detroit an event to remember! In education, I am always looking neat and interesting lessons to bring to my students. Different approached to long used themes might help a different group of students. As I sit and think about new ideas and cruise my Google Reader to see what amazing things other teachers are doing, I find myself thinking of more reasons why something will not work or be allowed than reasons why this new idea will work. Why is that? I wonder if that is a result of my district, state or something all together different. My district has switched to common assessments for all mid term and final exams. I'm not a fan of this because it doesn't allow me to differentiate for my individual classes come assessment time. Also, getting two departments at two very different high schools to agree on one test has been slow and painful. Multiple tests have been created and nothing seems to stick for more than a year in the past 5. Have I been beaten down by this concept of being like everyone else? Am I starting to worry about being different? In my first year of teaching, I did something totally different for final exam time for my American Literature classes. I created an Olympic style set of events and broke up each of the three classes into 3 colors. Each class competed in events on the football field that mixed questions and physicals challenges. There was a water balloon toss that forced students to take steps back if they answered questions incorrectly. There was a relay race where students had to construct responses to essay questions to advance in the relay. The assessment lasted 90 minutes and it was a blast. The students I still run into remember that event fondly. Layoffs, subject changes and the new common assessment prevent me from even considering do that again. I should say, it did. I've decided to stop looking at all of the reasons not to do something and focus on the positives. Now, I'm not going to knowingly do something that will break school policy, but I think that more good can be done if I start to focus on the yes instead of the no. Your #MissionMonday, if you choose to accept it, is to focus on the yes. Stop looking at the reasons why something will not work and focus on the reasons it will work. Do something new and see if it works. If it doesn't, so what. See if the lesson can be fixed and try it again. If it can't be fixed, try a new idea. I'm going to focus on the yes and see where that takes me. You should try it too. Grades. This is something that has always been linked to teaching and learning. By always, I of course mean, as long as I have been in school and a teacher. There is a segment of the educational world that is steadfast in their position against giving out grades. Education should be about learning and not obtaining a letter. I agree with people when they say this. I RT all comments during an #edchat that support this concept. After much thought, I think I can't get behind the concept of getting rid of all grades. No grades for anyone doesn't make sense to me. IMHO, grades are not the problem, assessments are the problem. I had my epiphany early in the year when I realized that my use of MC test and Scantrons were not really helping me assess the learning of my students. It made life easy for me to check tests and assign grades so student and parent could be happy. After doing my 10 Week Experiment, I realized that Project based learning is the way to go. With this type of assessment, I was able to see what students had really learned in a way that a Bubble Test could never show me. I went this route again, with some fine tuning, for my next unit, The Catcher in the Rye. The results so far have been amazing. Kids are actively engaged in the classroom, they are comparing projects and they are commenting on the projects presented. I feel like a good teacher watching these projects come together. I don't think throwing out the entire grading system is truly going to solve anything. Teaching is what really matters. We can throw out grades, we can give them new meaning, we can assign smiley faces or even assign random symbols. All that truly matters is the way that we teach students and the way we assess them. Students need to be taught to value education. Grades are not the reason students do not value education. I didn't value education because I was a knuckle head, not because the value of an A was too much pressure. The value of a Grade is determined by the level of instruction and assessment. I can say that the value of an A on one of these projects means more than the A a student received last year on a Bubble Test on the same topic. Getting rid of grading is not going to solve the problem of valuing education or learning. As people, we are always seeking some form of validation for what we do. That validation can come in the form of gold stars, blog comments, Retweets, promotions or letter grades. The value of hard work and a job well done in High School is a letter grade. Earning an A in my class is tough. I'm proud of that fact. I realized that my assessments needed to change to truly challenge my students and assess their learning in a way that allows for self expression and meets my content expectations. I know that this is not the popular idea, but this is how I feel. Now. I'm an open minded person. If I would have told me two years ago that I needed to move away from MC tests, I would have laughed at myself. (Side note: That would be so weird to hear yourself laugh outside of yourself. Almost like hearing a recording of your own voice. I always sound weird on those things. Anyway...) I think there are many different ways to teach the many different types of students. Differentiation is huge for me. If I want to give letter grades, I'm going to give letter grades. If I want to give smiley faces, I'm going to give smiley faces. I think that there is never a one size fits all solution for the ills of education. Eliminating Grades is not the end all be all solution. I think that is important to remember when we talk about changing the education landscape. Remember, It's not the letter we use to end an assessment, it's the assessment we use to arrive at the letter. Here are some great examples of student work I've been bragging about for the past few days. I tweeted some yesterday, but these were too good to live in Twitterland alone. The students have been great at posting on the presenters personal Wallwisher. It keeps them focused and the presenter has a great collection of comments to review later that day. The entire project is working very well and can be used with any content area. Take a look at the different projects and let me know what you think and I will pass them on to the students. Here is one great example of a Blabberize created by a student. Here is a cool project that used GoAnimate! Here is a Puppet Show by two students. Just goofy good times. Here are just a few examples of what my students can do. There is another one I can't put up yet that is amazing. A student tooks clips from the movie Stand By Me and linked it up to the story line of The Catcher in the Rye. It was just good stuff. He used Tubechop.com and it worked very well. Please leave a comment if you liked something or have a suggestion to improve the lesson. I'm always open to becoming a better teacher and making lesson stronger for the kids. I'll have some more projects later in the week. Thanks for stopping. I was working on some school stuff at home and I thought I had saved it to my Dropbox folder so I could access it later at school. I must have clicked the wrong folder because it was not there for me to access and that annoyed me very much. I needed to work on it at school and share it with other teachers. My wife had already left for work so I couldn't have her just email me the file. Luckily I had the LogMeIn App for my iPad because it saved the day. The App allowed me to synch up with my home computer from my iPad and search for the file. After some looking around, I found the file and was able to open my Dropbox folder and drop the document there. The internet at my school was acting a bit screwy, as normal, so I disconnected from my home desk top and opened up Dropbox on my iPad and there was the document. I opened up my DocsToGo App, because it links to my Dropbox account, and found the document I was looking for. I then emailed the document to myself and edited it without any problems. A complete disaster was averted. Now, I understand I could have just emailed the document from my home computer using the LogMeIn App, but I really wanted to see what my iPad could do using multiple apps. It was very nice knowing that one step could have solved the probelm, but I wanted to know how it would work if I needed multiple apps to solve a problem. The interface was quick and easy to use. The whole process did not take me more that 15 minutes. Most of that time was waking my home desk top up and connecting. Everything else was very quick and easy. For those of you who are unsure of getting an iPad, let me assure you that it has been worth the price for me. It has not solved world hunger, but it has made my life as an educator easier. That is important for any teacher to know. Here is Episode II of the Everything I Know About Technology Integration I Learned from Watching 90's Nickelodeon. I was inspired today for some reason to sit and write and outline for Episode II. The next thing I know, I'm typing away and searching for Youtube videos that will match up with each post. These posts are a labor of love and I hope you enjoy reading these as much as I enjoy writing them. I know that some of the ideas seem to repeat themselves, but I feel like they are good ideas that can never be stressed enough. Also, some of the other posts might not appeal to others and these might be reach a different audience. Sit back, relax and enjoy the ride as we take a trip back to Nickelodeon circa 1990's. Anyway, as teachers of technology, it is our job to help the Mr. Ernst's in our building as they struggle with new technology. We need to make sure there are many of us in the building with various strengths to help these teachers through the tough transition in their lives so they don't pack up and quit integrating technology into their lessons. Running a ranch is not an easy chore and neither is integrating brand new educational tools to something you have been teaching for 20 or 30 years. As teachers, our job should not be limited to helping our students learn. Our role as educators needs to expand to help all of the people in our district and across the globe learn about integrating technology into the classroom. If it weren't for the hired help at the Bar None Dude Ranch, we never would have experienced 3 great seasons of Hey Dude. Roundhouse was an amazing sketch comedy show that filled a wonderful niche. You were not quite old enough to stay up and watch/understand SNL and you were too old to go to bed at 9pm. Roundhouse had a very diverse cast that tackled everyday problems of young and pre-teens. Parent issues, peer pressure, bullying, etc were all addressed in a combination of skits and songs and dance. They were always able to bring everything back around to the topic of the episode and end on a positive note. Also, don't forget about the motorized recliner that the "Dad" would drive around in on the stage. That thing was awesome! Technology Integration needs to be approached the same way that Roundhouse approached serious issues for teens. If you try to sit a teacher or student down and try to walk them through GoogleDocs, Blabberize or Prezi, they will lose interest very quickly. I'm not suggesting that teachers start doing a song and dance about the value of Web2.0 tools in the classroom. However, it might not be a terrible thing to put together and become a YouTube sensation. :-) Actually having the teachers or students actively involved in exploring these tools would be a great way to show them value of these tools without lecturing to them. The songs, dances and comedy made the messages accessible to the audience and memorable. It's been 15 years, but I still remember those episodes like it was yesterday. Do you remember anything valuable from a staff meeting from last year? 2 years ago? 5 years? Using fun and interactive ways to pass important information along is vital if we want more and more teachers to start using Web2.0 tools in their lessons. Otherwise, these ideas will be ignored like our parents ignored our requests to go to Universal Studios in Orlando, Florida to be on Super Sloppy Double Dare. It's better than bad, it's good! from Erika on Vimeo. I love Ren and Stimpy and own every episode on DVD. I could write multiple posts all of the great characters and their role in the integration of technology in the classroom. I decided that I would focus on one part of the show that really stands out and people are most familiar. Log from Blammo is an excellent example of selling something that is not exciting through marketing. As a teacher, I need to constantly market the themes and symbols of various stories that students want nothing to do with. I need to convince them that Romeo and Juliet and To Kill a Mockingbird is relevant to their life and they need to understand them and even love them. This is never an easy trick to pull off. Some classes jump on board while others make me work for it. Technology is one great way to market ideas to students. Just presenting kids with the facts is not good enough anymore for the tech hungry student body. There are many different ways to spice up any lesson like Blammo did with Log. I started by eliminating Power Points from my class. I still have some, but over time the will all be gone. Students relate "boring" to Power Point. The minute I dropped my first Prezi on them, they were excited. It was one simple change using new Web2.0 tools that allowed students to experience the same old material in a new and exciting way. I have also started to use the concepts of Facebook pages for characters and Fotobabble shots of characters to bring the lesson alive. The students have been more engaged and have started using some f these tools for their presentations in my class and even other classes. A students used a Prezi in French class and the French teacher was excited to try it herself. Other students are starting to use Prezi in other classes as well. By simply using some simple, but new, tools, the students have been more engaged in lessons than previous groups of students. I've come to the end of Part II with the realization that all good things truly come in threes.It is only natural that I wrap up this series of posts with a solid third post. I say solid because the third part of anything is never as good as the second and can never hold a candle to the first. (Star Wars, Godfather, back to the Future, etc.) I think the Saved By The Bell post might have to be pushed back a bit so I can think about Part III. Now calm down. It will be some time before Part III makes an appearance, but here are some teasers that should hold you over until I get to finish my Epic Trilogy. Enjoy! I loved this show. Trashing a house was something we all wanted to do and some of us did and got grounded for. Sorry Mom. A combination of two of my favorite things at the time: Clarissa and Video Games. History and Obstacle Course? Why can't your History class be like this? This one is too easy to blog about. Here are some old Promos to hold you over. I realized that all of those videos were game shows. Hmmmm. Maybe Episode III will have a game show vibe. You will just have to wait and see. :-) Thanks for reading and being awesome educators. A couple of days ago I tweeted that I needed to create 90 Wallwishers for my American Lit students becuse they were getting ready to present their Catcher Projects next week. I received many responses asking about the Wallwishers, the project guidelines, etc. I promised to put together this post and share this project with all of those that are interested. I decided that I was going to have a Project Based Assessment after concluding my 10 Weeks and No Tests experiment (Read from the bottom up). I figured I would use the same idea I used for my Great Gatsby Project, but fine tune it a bit. I use a Livebinder for my class lessons and projects. Here is the one that I have used for this semester. American Literature Livebinder I have the instructions for the project here, but I will break it down here for you as well. The students will be allowed to express 2 themes and 2 symbols in any presentation form they would like. Their presentation must use technology and it must be approved by the teacher before they get started. The students also needed to use a different form of technology than they used for their Gatsby Project. I like this part of the project because it forces the students to explore other areas outside of Power Point if they chose the easy way out with Gatsby. After selecting their project, the students had two weeks to come up with a rubric and submit it to me on a Thursday. I provide the students with a link to Rubistar to help them create a solid rubric. I collect the rubric on Thursday and pass it back with corrections and suggestions on Friday. On Monday, the students will have a chance to work in the lab and make sure everything will work well on the school computers. They can practice their presentation and fix any minor bugs that they uncover. On Tuesday, students will be randomly selected for the rest of the week until every students has presented. The late idea I had on Friday was to have students provide feedback on the projects. I have used Wallwisher with the students in the past and they are comfortable with it. I created around 90 Wallwishers and placed them on my school website. Students in each class can go to this website and click on the name of the student presenting and leave constructive feedback on the presentation. I'm not worried about jerky students because I have them pretty well trained on proper computer use. I also threatened them with total point loss for everyone if one person breaks the rule. Hey, it works. After reading their walls, students will write a 2 paragraph response to the wall. One paragraph will focus on what went well and the other paragraph will focus on areas that could be improved. I think this will be more valuable than the comments I leave on their rubrics. I know that many students just look at the score on the rubric and move on to the next lesson. At least with this approach, the students will have to look at the comments and think about them as they craft a response. I will post some of the projects the students come up with after next week. If you have any questions, please feel free to leave me a comment or tweet me @TheNerdyTeacher and I will help you however I can. Thanks for reading this long winded post. See you on the flip side. Happy #Mission Monday everyone! Friday night I decided to unplug for the weekend so I could attend to a growing list of to dos. I chaperoned the Junior Prom and that was piece of cake. It's always nice to see kids in their best outfits having a good time with their peers. As teachers, we often forget to look at teens as teens and not just butts in a seat. That is why I loved being a class adviser, coach and chaperon. It gives me a chance to interact with the kids in a positive way outside of my room. I also spent some time working on my Masters program. I'm putting together a Grammar Web Quest and I will be bugging some of you for feed back later on. Thanks PLN. :-) I will be done with my Masters in Educational Technology by the end of the Summer of 2011. I can't wait. The extra pay will help offset the 3% of my paycheck that now has to go into the State Pension fund to help them balance the budget. Sweet! I guess the point that I'm trying to get at is unplugging was one of the best things I could have done for the weekend. I love being connected to my PLN and I'm positive that I missed some good resources this weekend, but the fact that I was able to do some great things over these two days was amazing. I suggest that everyone try to unplug for a day or two and see what you can accomplish away from the Twitter/Blog world. I know that my Reader is waiting for me, but it will always be there. Events like Prom and Tiger games with the wife will not always be there. Take the time to shut down and explore the world around you. It might be tough, but you will come back refreshed and ready to grow with the rest of the PLN. Let me know how yo have unplugged and what you did with your free time. It's nice for teachers to share these stories. We are all in this together people. As they say, it takes a PLN to raise a child. Full Disclosure, I'm no good at Math. It has never been my strong suit and I currently eat lunch with the Math Department in the hope I can build enough credit to have them tutor my future children. 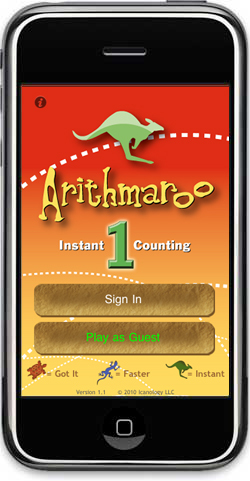 :-) I ran across Arithmaroo on Twitter and they suggested I take a look at their Arithmaroo 1: A Counting Math Game for Kids app. As an English teacher, I wasn't sure what to expect from this app, but the @Arithmaroo people were so nice, I couldn't say no. Here are my thoughts on the app. 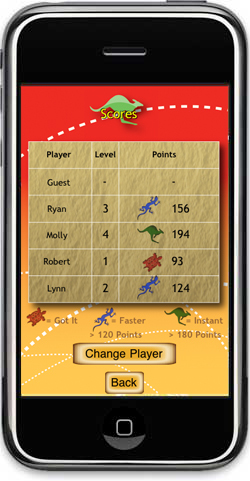 The app is a very simple game that allows up to 4 players and one guest to store scores and compare them with friends. The screen consists of a row of numbers and pictures that appear. The pictures might be rocks in various order or hands holding up fingers. 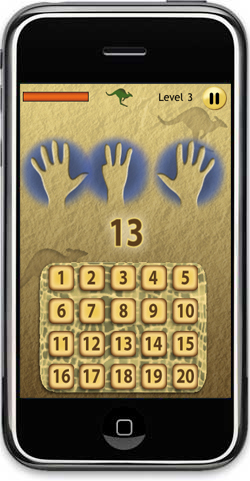 Their might be multiple hands with different number of fingers or many rocks in various formations.The goal is too quickly count the objects on the screen and select the correct number. As time ticks down, the picture at the top changes from a Kangaroo (fastest), a Salamander (Fast) and a Turtle (The Nerdy Teacher Speed). The first level is fairly simple and focuses on numbers 1-5. It took me a couple of times to get straight Kangaroos, but I eventually got through it. 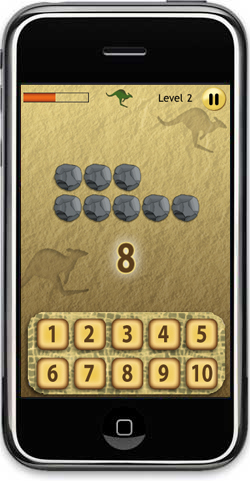 Level 2 has 10 numbers and the combination of rocks and fingers intensifies. Again, this took me many tries, but eventually I made it to level 3. Level 3 brought me to a dark place as I tried to count objects in the allotted time up to 20. After stressing for 20 minutes, I was able to jump to level 4 where the total number goes to 50. That is where the level review ends because I have no idea what is beyond that and may never find out. I guess it is 75 or 100, but I'll need to ask one of my younger cousins to give it try and let me know how it goes. I took a couple of days off from playing the app and went back and was surprised to see that I had an easier go of it the second time around. My responses were faster and I had more points than I did last time as well. I still could not get past level 4, but I felt that I was doing better. I was learning to identify patterns and identify quantity at a much faster pace. From that perspective, I would say the app is wonderful. If anything can improve my quick math skills, think it's great. As a high school English teacher, I can only guess how this would play in the Elementary Math classes. I think the fact that multiple students can store their scores on one app is great. It allows some nice competition amongst peers. Teachers could reward students for attaining certain levels and have class competitions if there are enough iPods to go around. Given time to play with this app, I can see that students would strengthen their Math skills. I have never been strong at looking at items and adding them up, but this app could help me grow in that area with continued use. I think the timer moves a little too fast, but I think that is because I'm terrible at counting quickly. I did not encounter any glitches along the way. I tried selecting various wrong answers to see if it would freeze or shut down, but nothing happened. The clock stood that at turtle, mocking me, as it waited for me to eventually get the correct answer. I think it would be nice to see different images over time, but since I never made it past level 4, I'm not sure if there were others. I think this would be a fun app to add to a class set of iPod Touches in Math classes or for personal use. The app looked great on the my iPad as well. Kids would strive to beat their previous best, their friends high scores and even their parents totals. For $1.99, I think it is a good buy if parents and/or teachers are looking at a fun way to help kids with their spatial math skills. Thanks to Arithmaroo for talking me into this app because I will be recommending it to the teachers in my district. Great job and I look forward to seeing other great apps from you in the future. I cannot tell you how many times I have heard that from my students. Another one I love to hear is, "What do you mean I can't use Wikipedia as a source?" As an English Teacher, I have spent many long hours teaching students how to conduct proper searches on the internet. They should never be able to tell you that they were never taught how to properly cite information or where to look that information up. With that having been said, sometimes I just want my students to look at a few specific websites for a specific project. I have started using a great site I want to share with you great teachers. The site is called Diigo and it is a bookmarking site. By creating a free profile, you can add specific pages to your account and direct students or other teachers to look at them. That is not the only thing you can do with this great tool though. Highlighting - You can highlight specific information before you bookmark the site. This can save people time when there is to much information to read through and all you want is a few lines. Sticky Notes - You can places notes on the highlighted areas to remind you of their relevance. There have been too many times where I have bookmarked a site and I could not remember why I saved it a day or so later. Groups - You can create specific groups and send pages you find to that group only. You can make the group a public group (anyone can join) or a private group (you select who can join). After some time, I will make the teacher's group a private group to keep nosy teenagers at bay. Email - You can directly email any site you find to yourself or other teachers. You can create an address book and send the site directly to students or to other teachers in your department. Teacher Account - You can request to sign up for a Teacher Account from Diigo. This will allow you to sign up students to join your specific groups that you have created. I have a Teacher Account, but am not using it with my students yet. I'm just creating groups and keeping them open to the public. I put links to them on my website so students can view the groups without an account. It could come in handy if I want to email them sites to look at over the weekend. Linking Accounts - Diigo allows you to link your blog and Twitter accounts to your Diigo account. This way, if you bookmark something, it can be posted to you blog and your Twitter. You can set up a your account to post all the bookmarks you have made to your blog. It can be set for a daily, twice daily or weekly. This is a great way to save you time. You can also link your iPhone to Diigo as well. Download the Diigo App and you will have access to anything that you have bookmarked. It might be available for other phones, but you would have to check for that. The best way to start bookmarking after you create your account is to download the toolbar. It will sit at the top of your browser and you just click the bookmark button when you want to share a website. There are many other great parts of Diigo that you can use. It's best to log on and play around a bit. Happy Monday everyone! Your mission, if you choose to accept it, is to keep a positive attitude. The end of the year is closing in on us and it is important to maintain a positive attitude to keep the kids focused and the rest of the staff in the right frame of mind. It seems simple, but it is too easy to little the little things get to you at this time of year. Keep a positive attitude and everything will fall into place for the rest of the school year. I was surprised to see that @2sparkley had passed on a nice little award to me from her blog. I've always done what I've done because it's goofy and I have the time. It's nice to get recognition from the people that read your work. I feel I've have learned so many great things from @2sparkley that her blog would have been at the top of my recommendation list. I'm happy to pass this award onto other great bloggers. 4. Inform the people you have nominated so they can pas on the love. Here are 10 tremendous blogs written by 10 even more tremendous people. I feel I have learned more from them than in any of my Educational Technology Masters Classes. They are helpful, friendly, smart and just all around awesome. As ESPN's Stuart Scott once said, "They are cooler than the other side of the pillow." I agree Stuart, I agree. 1. I Learn Technology by @Ktenkely is an amazing site. She updates like a mad woman and ALL of her resources are amazing. Many of them are geared for younger kids, but that is ok. If you are in the business of passing along great sites to other teachers, this site is the place to start. Some of the great things she shares make me want to teach in the Elementary School just so I could use them in my lessons. Heck, I might just use them with my HS English students they are that fun. Check out this site if you want to be cool. 3. Techno Constructivist by @anderscj is another wonderful blog that Mr. Anderson keeps regularly updated. He offers a weekly tech tip that I always find helpful and pass on to my friends and fellow teachers. He is a regular tweeter who is always willing to lend a helping hand to anyone in the PLN Tweeterverse. You are guaranteed to learn something new and helpful when you stop by his blog. Long story short, he is so awesome, he could make a Wolverine purr. 4. The Pursuit of Technology Integration Happiness by @Zimmer557 is another go to source for me as I cruise my Google Reader. He is a wonderfully helpful educator and his blog is filled with great materials for all teachers looking to add technology to their classes. You should bookmark this guy, because he will help you learn and grow as an educator. Basically, he makes Sinatra look like a hobo. 5. Vanessa Cassie's Blog is awesome! You can follow here at @VanessaSCassie To get to the point, her blog is important. Her posts on SmartBoard technology has made my teaching career easier. I know that I'm a cooler person for knowing her. I hope to meet her one day and shake her hand because he blog has been so helpful to me and my fellow SmartBoard teachers. I know I can count on her to answer any IWB questions I might have. Vanessa, you are a rock star! 8. Bright Ideas Blog is one of my favorite Australian blogs I read. @Brightideasblog is the matching Twitter account. I always know I can count on her to drop me a message if I have a question or leave a comment on my blog. She has wonderful resources on her blog and has great ideas to share with the PLN. Please take some time to stop by and check out her blog. If you don't, I might not be your friend anymore. 9. @EDge21 is a wonderful twitter account matched up to a wonderful blog. There are more links than a teacher know what to do with to be honest. Although he is a Penguins fan and I'm a Red Wings fan, his blog is still pretty amazing. Great teacher resources for all subjects and grade levels. There is no reason an educator should not check out this blog. He is wonderful to chat with on Twitter and always has something great to add to the conversation. I'm pretty sure Twitter would stop if he left. Follow him and keep Twitter alive for the rest of us. 10. @Sharnon007 has a great blog filled to the brim of resources. Reading Teachers Online Arsenal is a wonderful site that I check almost daily. There are always wonderful resources available and the tweets are helpful. I've shared a few Twitter conversations with her and I always walk away with something valuable. Take the time to peruse the blog and see what yu can find to help your lesson plans. Here are just 10 of the blogs that I read that have helped me on my educational journey. There are so many more that I use to improve myself as a teacher and I have the proof in my Google Reader if you want to see it. Please take the time to check out all of these blogs, leave a comment if you find something useful and pass the blogs along. We all need to support each other to make a difference in the world of education. Here is another great reason why I love my iPad. I spent the last hour working on another post when the power cut out. Now, I did not lose the post thanks to Bloggers auto save, but it is very annoying to not have power in your house. The weather is crappy, hence the no power, so I can't go outside. Since I have the 3G, I don't have to worry about no WiFi to use my iPad. Just scrolling around the pages of the iPad, I have more than enough to keep me busy until the power is turned back on. Heck, I am able to write this post because of the 3G and the keyboard accessory. For those of you out there that are skeptical about buying an iPad, just stop it already. It might not be the pinnacle of technology and it would be cool if it had a front facing camera (I'm sure that is in the next version), but what I have been able to do with my iPad has been very helpful in different situation. Heck, I was still able to run my classroom without missing a beat this week because of a virus that took out the students AND teacher servers. I was able to take attendance and enter in grades while other teachers were passing around sign in sheets for a few days. That was a nice feeling. Now, if you will excuse me, I'm off to watch A Nightmare on Elm Street. Here are some great sites I have found over the past few weeks and I thought I would pass them along to you. Remember that if you are new to the blog, you should check out some of my older posts to see if there is anything you might have missed that could be helpful in your classroom. Here is a great collection of Digital Storytelling tools collected by Ozge Karaoglu. Ozge is an awesome teacher that has put together some amazing collections of web tools for students to use. Click on her name to read her profile and see her e-portfolio. You should bookmark her page because she is sure to have something great to share with each post. Jog the Web - This is a great site passed on by Anne Carnevale's Blog. Jog the web allows a teacher to set up a series of web pages the students explore in a set order. The best part is that it also allows the teacher to leave annotated notes that lets the teacher ask guiding questions as the student explores the web page. This would be great to use for Web Quests. There are many great examples on the site, but here is one that was created to provide background on Anne Frank before the students read her diary. This could allow students to have a guided tour of important webpages from their home. This is worth a look. Awesome Stories is a search engine for Primary Resources. I think this site will be tremendously helpful in Social Studies classes as students look for court cases, biographies, news articles on important events and even video. Students often claim, "I can't find anything good to use." or "Why can't I just use Wikipedia?" Awesome Stories allows students to search a large archive of Primary Resources that should make their research easier and more meaningful. This should be a must have on all Social Studies websites for students doing research. Here is a great post on Free Technology For Teachers video tutorials on proper citation. As a High School English Teacher, I find that students still struggle with correct citation of information. These guided videos could help teach students the correct way to cite information they intend to use in papers or projects. Little things like this would be great to add to personal website so students can access them whenever they have questions about citation. The videos are geared more toward Upper Elementary and Middle School, but I think anyone that has citation questions could use this and learn. I hope you take a minute and look through these sites. They could come in very handy in class and really help students and even parents. Pass along these sites and consider posting them on your school site so students and parents can access the information from home. Here are a collection of Math Links I've put together over the past couple of weeks. I hope that you take a second and scan these sites. You do not have to use all of these in your classroom, but you should consider looking at them and consider placing the links on your school website and letting students and parents know about them. These sites below all offer Math help in different ways. Take a chance and see how these students can benefit from an online component to their Math Learning. Here is a great collection of Math Sites from @Kellyhines. She put together a Livebinder Collection of 16 helpful Math sites for students and teachers of all grade levels. This could be very helpful for teachers looking for different ways to present material and it could also be great for teachers looking for sites to send students who are looking for extra help. Teacher Zone is a site dedicated to Math videos. They will help explain concepts that are important to Math students from grades 3-10. This could be another way to show students important concepts in action. Adding these videos to your website could go a long way in helping a student learn an concept. It might even help a parent understand a concept so they can better help their child at home. MatheBook is another website that offers tutorials on Math and downloadable questions and answers to further help students understand difficult Math Concepts. I think it is great that there are more and more Math websites available to students and teachers. Websites are see have been more geared toward Science, Social Studies and English, but there are many kids waiting to use sites that focus on Math skills. This is another good one to share with students and staff. MathTrain.Tv is a wonderful site provides more Math help through video, but the thing that separates this from other Math sites is that the videos are created and uploaded by students. It's students helping students. This is a great concept to explore in your classroom. Imagine offering credit or extra credit to students that create Math videos to post to this site or even your own school website. Sometimes we learn ideas better if we have to teach them. This site is a great example of how Math can be interactive and use technology to spread ideas. I hope you give these sites a try and pass them on to your website for students and parents look at. In the long run, it could really help some students learn concepts they have been struggling to learn. On a slightly personal note, we (teachers) have a tentative agreement (TA) with our school district. Thanks to all of the teachers that supported my tweets and frustration. It was a long school year without a contract, but we can relax for the next four years and hope that the Michigan economy will find a way to support education. Thanks to all of the teachers in the district that didn't let the dark cloud of working without a contract get in the way of providing a stellar education the community has come to expect. Personally, I feel like I've been running non-stop since the start of the school year and I only started this blog and Twitter account in January. I cannot even wrap my brain around doing this all school year round. Yikes! Because of this endeavor, I have been able to make some great friends along the way. There are too many to even name, but you know who you are. We have been there supporting each other when the teaching world seems like a stranger to us. I know for a fact I would not be writing this post if it were not for all of you. Thanks again. Also, @JenniferPro (My amazing wife and soul mate) I never would have been able to make it through this school year without you. If other teachers are reading this, give those significant others a huge kiss. They deserve it for putting up with teachers that commit the kind of time we do to Twitter and Blogs to make ourselves and other better. What's next for The Nerdy Teacher? Here are some things I have lined up till the end of the school year. They are in no particular order. 1. I will finish the second half of my 90's Nick Tech Integration Post. Not as popular as the movie ones, but as I said, the select few that get it, loved it. 2. I feel I would be crazy not to do a Saved By The Bell Tech Integration Post. I feel that is lined up in July when I should be Lesson Planning but will be watching re-runs of SBTB on TBS. 4. Continued work on my Masters. Ughhhhh, but it will pay the bills later on. 5. Find an 80's movies I haven't seen. This will take all summer I suppose. 6. Convince the powers that be that WiFi should be pen to Teachers and Students. Encourage students to bring their laptops into school and use them as exploration tools of education instead of really fancy typewriters. 9. Tweet up with my new friends at ISTE! I can't freaking wait for this! I'm making t-shirt for this and they will be Epic. I'll post my concepts so you can order yours. Again, E P I C ! 10. Change the world of education one Tweet/Blog Post at a time. I used my iPad in the classroom today for the first time. I wasn't able to do too much with it, but here are some of the things I really enjoyd about it and what I think I could do with it in the future. For the most part, I was able to use it for email and attendance without any problem. I have to use the 3G because the school will not allow teachers access to the WiFi that is in parts of the building. No reason has been given to us, we are just not allowed to use it. It was nice to walk around the room and take attendance desk to desk and talk tot he students. I think little things like that can save some time and allow me the walk around the room and make sure the kids are getting ready for the rest of the class period. Since out attendance is web based, it was easy to log on and mark the students absent if they were not here. My iPad moved much faster than the Dell Desktop. I jumped right on the web and had attendance taken in half the time of using the school computer. That is a huge bonus. There were a few instances that students needed copies of documents that they missed and I was able to use DropBbox and my email to send them the documents they needed for later in the day. Sometimes I find myself waiting for emails from other teachers or students regarding projects and I run back to the computer when the email tone goes off. With the iPad, I can easily check my school email on another Safari page without a problem. I can then use that to respond to teachers or students on the spot while keeping a close eye on the students around me as I stroll around the class. Many people asked me what my favorite app for the iPad has been so far. I would have to say Dropbox. The reason this is my favorite app, is because it allows me access to all of my documents when I want them. There is nothing worse than when a student wants to talk about a handout and I don't have one on hand to explain what I was thinking. Dropbox allows me to have all of my documents right away. I don't need to go back to the desktop of the filing cabinet. I can even send the kids a digital copy if they want an extra just in case. That type of convenience is what I love about the iPad. Some students said that it is just a big iPod Touch. Yes, it can be if that is how you use it. I see it as so much more. I have been using my iPhone to keep all of my lesson plans on. I use a program called Planbook that allows me to create lessons and then sink them up to my iCal. It has been great to use. It allows me to be free of writing everything out by hand and trying to decipher all of my notes for the next year. Now, I can just set the start date for the next school year and all of my lessons will shift to that new date. No longer do I have to go through lesson plan after lesson plan. I also save the weeks worth of work as a PDF and post it on my school web-page for students and parents to download. It allows me to bring all of my lessons onto one color coded page. I don't have to search for the lesson plan for each class because they are all in one spot that I can then share with any student I want. A dream class would be 35 16G iPads with WiFi. This would allow all of the students the ability to clearly see and type responses to blog posts or even create blog posts to share with the world. Tweets, texts, files, videos, etc could all be shared through the WiFi network and a piece of paper would never have to exchange hands. The future is now. Besides price (Which I understand is the biggest issue in education and everywhere else), there really is no reason why entire classes, at least at the HS level, could not completely function on iPads. In English, just about all of the texts we use can be accessed for free or at a small price through the iBook Store. It seems like a simple step to take instead of spending tens of thousands on brand new textbooks. My iPad was delivered yesterday and I couldn't be happier. I took it out of the box and loaded it with all of the goodies I've had my eye on for months. The picture is clear and sound is great. The keyboard is easy to use and few mistakes are made. I would say I make the same amount of mistakes I do using a normal keyboard. I've never hid my nerviness when it comes to Mac. Some might call me a fanboy, but Apple is the company I grew up with. My dad bought the first Mac and told us that computers were going to be the future and we needed to learn how to use them. Since that Christmas day many years ago, I've been a Mac fan. Back to the "magical" device. I understand that some people say it's just a bigger iPod touch. Yes, it is bigger and does many of the same things as the Touch. That argument does not hold any water if you are still using 12 inch screens to watch TV. The iPad allows me to see much more and read easier. My iCal is much larger and I can now see all of my lesson plans at once, instead of shuffling through other screens on my iPhone. Reading books and news articles is wonderful on the iPad as well. I loved using my iPhone to cruise through the news, but it is small and tough to maneuver at times. The iPad allows me to quickly surf the internet with little problem. It will make that part of my life much easier. After messing around with it for a few hours, I was constantly thinking of all of the ways that this can be used in my classroom. Here are some of the ideas I came up with. I'm sure this will be a growing list and please feel free to comment and offer other ideas. I would love to have a class set of iPod Touches. The uses would be endless and my iPad would allow me to interact with all of my students at once. Here is what I'm thinking. As an English teacher, discussion plays a large part in the learning process. Getting kids to discuss new and different ideas can be tough, but it is important. I've used Discussion Boards and Wallwishers to help facilitate discussion and it has helped some of the quieter students have a voice. While Wallwisher does allow for some instant feedback, I would like to see even more in the classroom and that is where iPod touches could come in. I would love for each one of my classes to have a twitter account and we could make connections with other schools around the world and tweet about books, poem, short stories, themes, etc. We all know that education needs to move toward a more global mindset. Technology offers schools the ability to knock down old barriers and make global connections. Imagine a 30 minute class discussion on Rome and Juliet with a class from New York, Atlanta, Boston or even Grosse Pointe North. :-) Instant communication around the globe is just one great use of the Touches in the classroom. Twitter could also be used as a way to quickly poll the class on ideas or questions that have come up in class. By using a hash tag, the ideas then can be archived for students to review at a later date. That is what makes it special. Blogging is going to be a major part of my classes next year. Each class will have their own blog and a student will be assigned to recap the days learning and post the next days topic and homework. Students will be given the chance to comment on the student's post and add anything they felt was important for the days discussion. This will allow students who miss school to see what happened while they were gone, parents will be able to see exactly what happened in their son/daughter's class and the blogs could be opened up to other schools from all over to keep the conversation going. Imagine a blog run by a Freshmen English class that posts their comments on "To Kill a Mockingbird" and they wake up the next day to see what students in Germany, Italy or Japan have to say about the text they are reading as well. This type of connection is crucial as we push our students to expand their view of the world. The Touches would allow the students to view the blog, respond to comments and even search for information without needing the teacher to sign up for limited lab space. More classes are going to be computers for projects and work and there is only so much lab space. The Touches allow computer access to a full class of students without having to leave the room. The iPad would be used as a hub for all of the information flowing in and out of the classroom. It will allow me to keep a Twitter feed flowing and walk around the classroom while I project information from my desktop onto the Smartboard. My classroom will become a completely interactive zone. I'll be able to send information to all of my students at the touch of the screen. Students will then be able to access the information from their own iPod or iPhones once the information is out there. I downloaded the Shakespeare App and it is awesome. I have complete access to all of his works with the ability to annotate as I read.This app is available for Touches and the iPhone as well. It would be great to be able to have students have access to the Complete Works of Shakespeare. Have you seen how big those books normally are? They are huge! Now I have every word he penned at my finger tips. E-book are the next step and the iPad is a great tool for that. Buying large textbooks is not very economical today. In English, they are too big and bulky for kids to carry around and most of the book can be found on-line as it is. Why have kids carry around these huge books when they can read the same story on-line for free? Most English teachers use other content to supplement that reading that comes from other sources outside of the textbook. We've seen SciFi movies where students walked around with their tablets and had complete access to all of the content presented in class. That doesn't seem so crazy anymore. As teachers, our job is to make the information as accessible to the students. The information is out there and the students can get it without us if they really want to. We need to teach them how to find the information and the true capabilities of the devices the have. It will always be tough for teachers to learn and manage new technology in the classroom, but this movement toward free flowing, social networking, global education is not going to go away. The iPad and the iTouch could be used to knock down walls and introduce our students to a world they would never see otherwise. - P.S. - I wrote this entire post from my iPad. Cool huh?